2 Apr : Delhi Metro’s network just got bigger on Friday with the inauguration of Inderlok-Mundka corridor, the country s first standard gauge line, which will traverse through some of the densely populated areas of the national capital. The 15.1 km corridor, also known as the ‘Green Line’ which will benefit over a lakh commuters in the city’s west and north-west areas, was declared open by Union Urban Development Minister S Jaipal Reddy and Delhi Chief Minister Sheila Dikshit. They flagged-off a brand new Standard Gauge metro train at the Inderlok metro station and travelled on it till Paschim Vihar station. The line, which will be the fifth of the Delhi Metro’s vast expanding network, will be opened for the public from 6 am Saturday. This will be the first standard gauge metro line in the country. DMRC’s other lines are broad gauge. This makes the Delhi Metro probably the only Metro in the world which will operate on both standard gauge and broad gauge in the same city. Reddy said it was a “historic occasion” and this was the first such kind of a corridor in the country. “It is a milestone,” he said noting standard gauge will be used in the upcoming Metro projects in Chennai, Mumbai and Hyderabad. 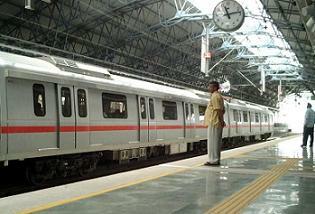 “By adopting standard gauge, we can save money and DMRC has told me that Rs 72 crore by adopting this system,” he said. The corridor, also called the Green Line, will connect two existing stations — Inderlok (on Line 1 Dilshad Garden-Rithala line) and Kirti Nagar (on Line 3 Dwarka Sec9-Noida City Centre/Anand Vihar line). Passengers will be able to interchange for Line 1 line from the same platform at the Inderlok station. A small section of the line from Ashok Park-Kirti Nagar is expected to be opened only by next month. Thus, initially the line will be only connected with Line 1. The travel time between Inderlok to Mundka will be 29 minutes on the Metro as compared to more than an hour by road and the line will benefit thousands of people in thickly-populated areas like Punjabi Bagh and Paschim Vihar. The DMRC has procured 17 standard gauge trains from a consortium of Mitsubishi and Bharat Earth Movers Limited, Bangalore and will initially put 13 on the service. During peak hours, the frequency would be 5 minutes. DMRC projects that at least 2.5 lakh commuters would be added to Metro’s expanding network in the capital by the end of 2010 with the opening of the Mundka-Inderlok line. Other lines will be opened before the Games are Central Secretariat-Badarpur, Central Secretariat-Gurgaon and New Delhi-Airport Express Line. Union Urban Dev Minister S Jaipal Reddy has said Metro rail system in cities like Mumbai and Chennai will be built on Standard Gauge, which is used in most of the new age transport systems in the world. Reddy said the Standard Gauge is cost-effective when compared to the broad gauge system, which is being used in Delhi Metro so far. Speaking to reporters after flagging off the country’s first Standard Gauge train on DMRC’s Inderlok-Mundka route, Reddy said it was a historic occasion. “It is an historic ocassion. This is the first such kind of a corridor in the country. It is a milestone in the country’s metro system,” he said on Friday. “Since Standard Gauge system is used in 95 of the metro system in the world, the upcoming metro projects in Chennai, Mumbai, Hyderabad and other cities will have Standard Gauge,” he said. “By adopting standard gauge, we can save money and DMRC has told me that it has saved Rs 72 crore on this 15.1 km stretch (Inderlok-Mundka) by adopting this system,” he said. Delhi Chief Minister Sheila Dikshit said with the Phase-II of the DMRC nearing completion by this year, the DMRC has started preparations for the Phase-III. A Detailed Project Report of the Phase-III is being prepared by the DMRC. “I feel proud to be here on the opening of this line. I commend the whole team led by DMRC chief E Sreedharan,” she said.